Sierraform GT Anti-Stress is ideal for applying as a pre-stress conditioner. Half of the nitrogen is slowly made available, which minimises growth surges. It comes equipped with ICL’s patented MU2 and SilK coating technologies. The added iron content enhances turf colour. 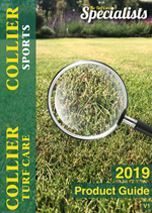 Anti Stress' high levels of potassium help to harden turf during stressful summer or autumn conditions and its phosphate free formulation aids management of soil phosphorus build up. It is particularly suited for use on fine turf areas.